The District Attorney and the Mayor's Office to Combat Domestic Violence will host trainings for salon professionals on how to spot domestic violence victims and point them in the direction of help. STATEN ISLAND — Customers of Tiara Milton, owner of She & Her Hair Studio in West Brighton, often tell her just about everything going on in their lives while sitting in her chair. Almost every day Milton sees a customer who's dealing with some kind of domestic issue. "We can’t say much, it's more about us being the listener," said Milton, who's owned the 450 Castleton Ave. shop for nearly three years. "It's just more of one-on-one talks about knowing their self worth and just really keeping it based on them." A new program aims to give stylists like Milton the ability to spot domestic violence and the tools to help their clients get help as the borough deals with rising accounts of abuse. The program is being sponsored by District Attorney Michael McMahon and the Mayor's Office to Combat Domestic Violence (OCDV). 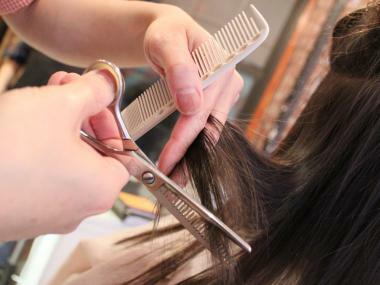 "Salon workers have a unique relationship with their customers, and can offer a safe space for them to confide in a trusted source," McMahon said in a statement. "When equipped with the proper training to recognize signs of abuse, salon workers can empower victims to find the help they need but may be too scared to seek on their own." Domestic violence cases have been on the rise in Staten Island for the past several years and the borough had a 64 percent increase in incidents from 2010 to 2014, the highest in the city, according to McMahon. McMahon added that many cases go unreported because of fear and stigma, something they hope hair stylists can help break. Marjoe Mayson-Olyaiya, owner of Massa's Hair Studio at 848 Castleton Ave., said that while she's never noticed a customer who is a victim of domestic violence, she agreed with the DA that she could possibly help in the future because she usually serves as a source of advice for her clients on all topics. "If they’re not comfortable telling people they’re close to, I think that it would be a great program so that the stylist can recognize and speak to them in different ways," said Mayson-Olyaiya. "If you're sitting somewhere for an hour or two hours you tend to build a relationship." She added that she often sees the same client for years on end so it's easier to spot changes in them if she knew what to look out for. Milton agreed that it's a good idea to target hair stylists to help driving down domestic violence numbers and would be interested in attending the training herself. "That's just me giving back to my community and possible helping those out seeking it," she said. While overall crime has went down overall so far this year, Staten Island had a 21 percent increase in rapes and sexual assaults which mostly stem from domestic violence incidents, McMahon said. In an effort to curb the numbers, the city finally opened the borough's first Family Justice center in 2016 after years of delays and two groundbreaking ceremonies. The center is designed to be a "one-stop" for victims and their families to seek help. Other boroughs in the city have also offered similar events for salon professionals since 2014, and the DA plans to work with them to host more trainings locally. State lawmakers have also pushed new legislation this year, modeled after one in Illinois, which would require hair stylists, nail technicians and skin-care specialists receive domestic violence training before they get their license, the New York Post reported. Staten Island's training sessions will be voluntary and the first one is scheduled for Oct. 23 at the Family Justice Center. Staff from the DA and OCDV will discuss the impact on domestic violence victims and their children, risk assessment, safety planning and more, McMahon said. Salon owners and workers interested in the training can call Carrie Knight at 718-697-4304 for more information.